When Concurrent Engineering comes to be discussed, the most action is to be taken around the first stages of a product life cycle. All the stages on the development of the product are affected/benefited directly or indirectly by CE, but is in the design process where the “how the product is going to be done” is decided. CE is based on identifying all the parts that are going to have an input into the product life-cycle, and make them work together in parallel during the design stage, influencing one on another. The subsets of CE include, for instance, design for manufacturing, design for assembly, design for maintenance and others. The Product Design Specification will be the output of all these parts working together, exchanging information for achieving optimal specifications. Many companies have implemented these concepts. It is remarkable the aerospace industry, where competition and customer requirements makes necessary to reduce the time to market, the high cost of prototypes and the minimum opportunities to change the model once the design has been accepted. Airbus is known for its attitude to Concurrent Engineering. All Airbus centres are spread around Europe, and resources, equipment and information from different sites are needed in order to specify the product. Two examples are going to be described here, to illustrate the importance of a Concurrent Engineering strategy to set the Product Design Specification. Both examples are related to Ford Motor Company, and have been supported from Syan, C. S. (1994). The first one is related with the consequences of ignoring CE, and the second one, applying CE principles. The first example, is associated with the development of the Model T. This model was mean to include the first engine with all the cylinders in one block (DOHC), and a novel transmission system (MT75). This transmission had to be used with different engines and different car models. The design was carried out by Henry Ford and other engineers. The product specifications came from the minds of the design engineers, not even hearing the “voice of the customer”. Initial decisions were taken in terms of volume of production, design and materials. From the different sites that Ford had in Europe, it was decided that the engine was going to be built in Cologne, starting by 1st of July of 1986. The budget for the project was decided at this stage. After the tool manufacturers were contacted and agreed to do the job, new design modifications became obvious, the tool orders put on hold, and when the modifications were accepted, tools were re-order (later delivery time and new budget from the tool manufacturers). In the mean time, an increased productivity in the UK was decisive for changing Cologne for Dagenham as the chosen place for manufacturing the engine. After producing some prototypes of engines and transmissions, any of both were given the expected performance. Machines could not cope with the expected precision at that manufacturing rate, and leakages were detected. Some modifications in the transmission (rivets introduced by the material suppliers) resulted in failures in the inspecting section. As a result, 9 variations for the transmission cage were finally manufactured and 220 changes of design in the whole system, affecting cost and schedules. The 1st Model was offered to the customer on 1989, three years after the expected. By that time, customer needs have changed, and competitors have placed in the market better models. The second case also looks at Ford and how they learnt from their mistakes. In 1984 Ford began the contacts for the manufacturing of a new engine, the ‘Zeta’ engine. In this case, just the cylinders were mean to be changed from the existing ‘Erika’ engines. Foundries were asked to give quotations when the design was in an early stage (no materials or dimensions were determined). This permitted them to provide different production patterns with no queuing time for production. Decisions on the product were taken on these bases. Once suppliers (for materials, tools and machinery) were consulted it was decided that Europe was going to be the design centre, and UK and US the manufacturing sites. The European engine department was asked to design a model that could be used around the world and was responsible, apart from the engine development for establishing the production process, purchasing and sourcing components and resources. Suppliers were involved in the design specification for the product design and manufacturing issues before the equipment was ordered. Between the design issues were durability, noise, vibration, performance and cost, and each of the parts involved had the chance of reporting their appreciations and proposed solutions. In the manufacturing side, they were asked also to provide cost efficient manufacturing, minimize components and automated assembly. These two examples are aiming to illustrate the importance of concurrent engineering for determine the Product Design Specifications. And how important is to get involved all the parts that have any input in the product life cycle. New technologies are being used to halve the time taken from designing a product to its commercialization. Virtual universes as the well known Second Life are used to test products, and give designers the possibility to have their ideas tested by potential customers, even before this product or a prototype has been manufactured. But this vision would not be so effective without the flexibility provided by strategies as concurrent engineering. Theses strategies permit to evaluate in parallel different variations of the product up to the end of the process, and decide which one would fit better with the customer requirements just before manufacturing it. Or, even manufacture diverse variations of the same product if this is feasible and suits different market sectors. As it has been discussed, it is at the beginning of the product life-cycle where most of the changes and decisions are taken. This front line constrains aspects as cost, materials, manufacturing process, etc. And is at this first stage where more money and time are invested (prototypes have to be built and tested, tools purchased, etc). See fig1 in appendix. Concurrent Engineering adopts that all the different parts that are going to take part during the product life-cycle (design, manufacturing, service, etc.) have to be involved to work in the current version of the product/plan. Activities involving the development of the product overlap, and are tackled in parallel. Therefore, the product life-cycle is notably reduced at the first stages. A good example can be that different departments of the company working with the same updated sets of data permits that a department is capable to write a instructions manual or the packaging design and system without needing to wait for the definitive version of the product. If the design is changed at some stage, this department will receive automatically the last version and can do immediate corrections. In the other hand there is an example to illustrate what comes when design becomes fragmented and overspecialized, and principles of Concurrent Engineering are not adopted: “The design process of a single part of a car mandates 350 steps. Not 350 calculations, but 350 workups requiring 350 signatures. No wonder it takes five years to design a car, that’s one signature every 3 ½ days” Whitney, E. (1994). It is well known among manufacturers that the original idea that has been designed never works as intended, and modifications, new materials or electronic adjustments are expected. Even when the initial design is submitted to several iterations in the system to make sure that the final product is going to fulfil the requirements concurrent engineering favours this modifications, assuring a higher quality output. Design must be understood to be relevant further than the initial stages. If manufacturing and assembly are not taken into consideration at these stages, problems can arise later on. Manufacturing engineers that have notice beforehand of which materials are intended to be used (more and more if these are new materials) can have their go at testing the machinability of these materials beforehand, and be ready to start the production. Similarly, tool designers that are aware early on what specifications the final product is intended to have, and production engineers, can suggest modifications based on the existing machinery, plan to acquire new one, or decide about the routing of the product in the job shop. Not only this, also suggestions in reducing the number of parts (subassemblies) can result in fewer operations and a faster more consistent production. By identifying and grouping subassemblies we are not just reducing the manufacturing process. If, in the future market specifications change, a quicker response can be done by little modification or re-grouping these subassemblies. Test procedures and operations carried on during manufacturing are also constrained by the initial product design. If different products (or variations of the same product) are going to be manufactured, it is ideal that the set-up or changeover time for the machinery involved is minimum (equal to 0 ideally). This involves the close work between design, process engineering and manufacturing team. Witney E. (1994) mentions another submerged characteristic of Concurrent Engineering, that might not be generally applicable, but in some companies. The design team gets used to each other, and builds social relationships. This leads to communication in informal ways and not in time consuming meetings. Complications are naturally shared, and time reduced. 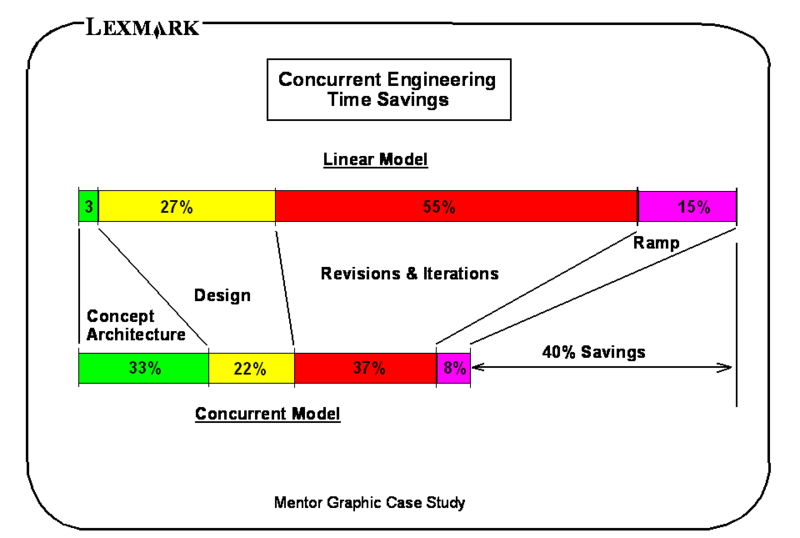 Concurrent engineering is based in an active approach to problem solving. This means that different departments working together over the same idea along the product life cycle can solve or get ready to solve problems before these ones appear. It is time consuming to look for a solution when a product has already left the design stages; therefore concurrent engineering prevents problems to arise later tackling the problem before product specifications are established. This strategy reduces the product lead time, by preventing later problems. Browne, J. (1988) Production Management Systems, a CIM perspective. Addison-Wesley Publishing Company. Cornwall, England. Cane, A. (2007) FT Report – Digital Business: Designs are flying off the drawing board in Financial Times. Published on February the 28th of 2007. Financial Times, London, England. Rehg, J.A; Kraebber, H.W. (2005) Computer Integrated Manufacturing. Ed Prentice Hall. Third edition. New Jersey, USA. 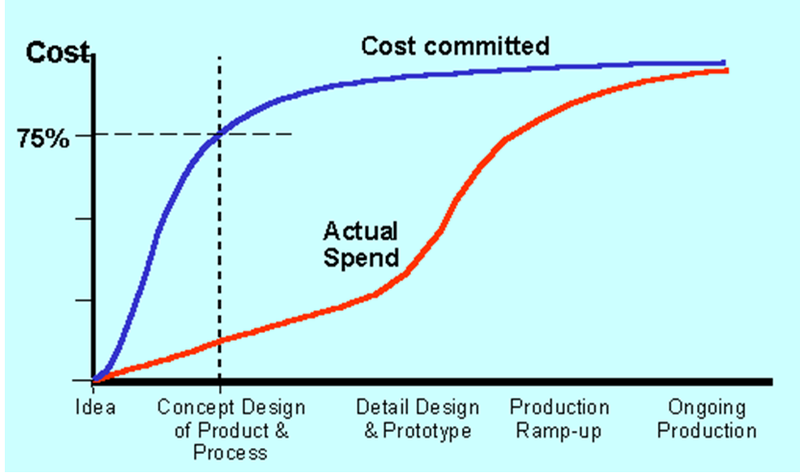 Witney, E (1994) Manufacturing by Design in Implementing New Technologies. Innovation and the Management of Technology. Second Edition. Page 260. Blackwell Ltd. Manchester, England.